When a pokie is based on a film, we don’t generally expect it to be based on a kid’s film. However, while Rango is indeed animated it actually isn’t considered to be completely a kid’s movie – instead the older kids and adults can enjoy it too. So while we were initially concerned for the theme, iSoftBet have actually chosen an ideal film to base a real money pokie on and we are treated to an action packed pokie with 3D graphics from the top software developer. Rango is based on a chameleon named Rango (voiced by Johnny Depp) who escapes the domestic life to find something more. He heads to the town Dirt where he is put in some interesting situations.The film is quite entertaining so don’t be put off by the animations or the plot as adults will enjoy it too, but for those who prefer to win real money while hearing Depp’s voice can play the pokie and even win a small progressive jackpot. The pokie features 5 reels and 25 paylines with a distinct Wild West setting to tie in with the town of Dirt. The graphics are crisp and iSoftBet have utilised 3D technology to immerse the player into the game as we follow Rango on his adventures. Coin sizes range from 0.01 to 0.50 with a minimum bet of $0.25 and a maximum bet of $125 available. There is the requisite to wager at least $2.50 per spin in order to trigger the progressive (see below). Symbols include the traditional A to 9 symbols representing the lower paying symbols, while characters from the movie represent the middle paying symbols. The Wild symbol is Rattlesnake Jake and substitutes for all symbols except the Scatter and the progressive jackpot. The Wild can be found in the base game as well as the Free Spins feature. The next symbol to keep an eye out for is the Scatter symbol – the Sheriff badge with ‘Rango’ written across it. You need at least three to trigger the Free Spins feature, which we detail below. Finally, if you are playing for the progressive, and sticking to the minimum of $2.50 per spin, keep an eye out for the progressive jackpot symbol which is the symbol with the text ‘Progressive Jackpot’. You need five on an active payline to trigger the jackpot. For more information on the payouts, simply click on the paytable icon, which is the small ‘i’ symbol found in the bottom left hand screen. Rango offers a standard Free Spins feature activated via three Scatter symbols, and a unique Free Spins bonus round too, as well as a progressive jackpot. This means there is only the chance of having, at most, nine free spins with a multiplier, which is a bit of a drawback. 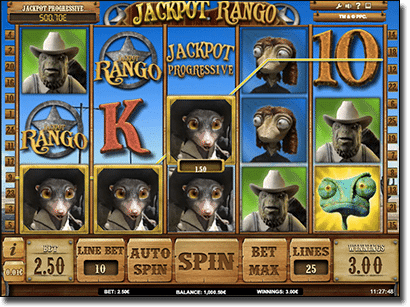 The other way you can score free spins is by spinning at least two Rango symbols, which is the chameleon. Here you will receive two free spins and the two Rango symbols will turn Wild, while any standard Wilds will turn Sticky and remain for the free spins. As we detailed above, players need to be playing $2.50 per spin in order to activate the jackpot. This is the maximum bet per line and here you will need to land five Progressive Jackpot symbols on an active payline to win the jackpot. The jackpot is nowhere near as big as what you’ll find on some of the best progressives online, such as Mega Moolah or Mega Fortune, as it is on a smaller jackpot network. This means it might not be worth it for smaller bankroll players. Many of iSoftBet pokies have been optimised for mobile devices including Rango which means if you are a smartphone or tablet player you can tap on our links to our online casinos – each offering a mobile site – and play the pokie on your Apple, Android, Windows, or other portable device. You can win the jackpot on your mobile device too, changing the way you play games on your phone or tablet. For desktop players after Rango we recommend clicking on www.SlotsMillion.com, our number one pokies online casino thanks to the huge 1000+ catalogue. Smartphone and tablet (Android, iPhone, iPad) players can access the mobile version of Rango, too. Slots Million is incredibly secure and you can sign up on any device simply by following our links and clicking ‘Join’. We can’t fault the aesthetics of this pokie by iSoftBet – the graphics have been done superbly and ring true to the film’s animations.However, the requisite of spinning Wilds for multipliers during the Free Spins feature is somewhat a drawback and if you don’t manage to spin any at all, then you don’t receive any multipliers whatsoever. The extra addition of two Free Spins every time you spin two Rango symbols does give this pokie back some credibility and the Sticky Wild means two free spins at potentially big wins. The progressive is only convenient for players with a large bankroll as the risk verse reward, or maximum bet verse size of the progressive – €500.70 at the time of writing at Slots Million – isn’t really worth it. We tried the pokie out on our smartphone too and the graphics weren’t compromised, so if you are a mobile device player you won’t be limited when it comes to graphics or smooth gameplay. 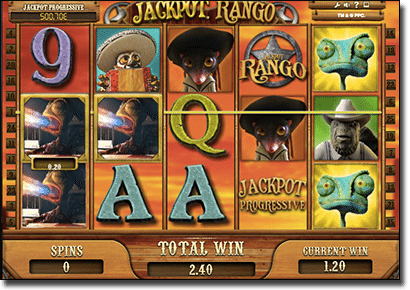 Overall, Rango is a really cool slot game but it can get a bit expensive so it might be suited to players with a larger bankroll.